Subwoofers are mainly designed to improve the audio quality of your sound system. They anticipate and reproduce sound with low frequency and thus help you to experience amazing audio out of your home theater. Comparing to most of the speakers, subwoofers can improve audio level much better. To introduce the subwoofer to your home theater, you’ll require an audio or video receiver and several speakers. Connecting the subwoofer perfectly with the receiver system is a very crucial part. Usually, you just have to plug in the subwoofer to the ‘sub out’ port of the receiver. But, what will you do if your receiver has no subwoofer output? To help you in this regard here we are with some easy and efficient solutions. Let’s know about them. First of all, learn about the management of your AV receiver bass. To do this, set all the center, rears, and main (both front and left) speakers either in the large group or small group based on their output powers. Follow the manufacturer’s guideline to learn more information about the bass management setting procedures. However, it is generally recommended to array the set of speakers from small to large. So, to get the best output, set all your speakers likewise and utilize an 80 Hz crossover setting. When you place your main left and front speakers to small, the subwoofers work really well. This is effective even with two-channel sound sources. Basically, when you set the main speakers to the large pattern, the things tend to be a little bit problematic. This procedure is effective when you set your left and right main speakers to large. Find out the subwoofer setting in your receiver. The ‘bass out’ feature of your AC receiver assists you to realize when and how you can operate your subwoofer. Then, set the ‘mains + LFE’ for allowing your subwoofer to play when the front speakers are arranged to large. Also, there are some receivers with bass management facility for two channels. They offer you independent crossover settings, slow up/down levels, and so on. Besides, you can decide whether you need to activate the subwoofer for two-channel audio sources or not. 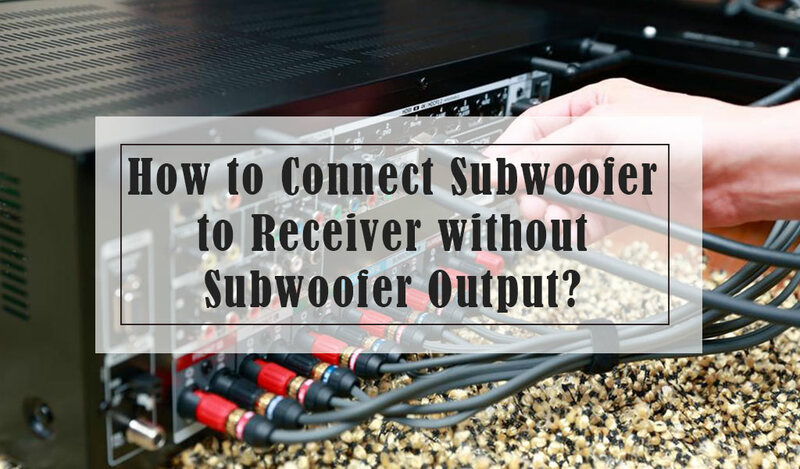 If your receiver has no subwoofer output, you can still connect a subwoofer to it. Check in the rear panel of the receiver to see whether it has a preamp output or not. It is usually marked as ‘pre-out’. When you find the pre-out, use a couple of interconnects from the receiver to your subwoofer. If your subwoofer has only one RCA input, add a Y adapter to it having one male RCA on one closure and two female RCAs on the other closure. Again, there is no preamp output on your receiver; you may use your subwoofer like a speaker. Run speaker wires to join the subwoofer to the receiver. Connect it to the front right and left speaker terminals of the receiver. Then, connect those front left & right speakers to the speaker terminal of the subwoofer. Usually, the subwoofers available in the market come with the speaker-level facilities. Still, you should check before you purchase yours. A subwoofer can modify the low note sounds which the speakers can’t. So, you can actually feel the sound like a vibe in your chest. Connect the subwoofer to the receiver of your home theater and have an amazing sound experience. Follow the instructions mentioned here for connecting your receiver with no sub out system to the subwoofer.